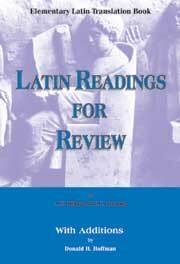 Latin Readings for Review is a useful book to accompany and supplement any first-year Latin texts currently in use. The Latin is pure, simple, idiomatic, and easily understood by beginning high school and college students. This book's greatest accomplishment is in its masterful introduction of new grammatical forms and constructions one by one in a carefully graded order. A translation piece never includes a declined form or conjunction that the student has not already learned. The student is never overwhelmed or frustrated by the material, and is encouraged to continue the learning process. Each review features two readings: one on Roman history and another from Greek mythology. This text could be very helpful to teachers wanting to offer interesting supplementary readings as an alternative to the often stilted material available for the beginning of the Latin reading experience. Its format provides most of what is needed — grammar, vocabulary, history, myth, and the ability to read Latin in a meaningful context. This elementary translation book is an ideal supplement to help strengthen grammatical concepts learned in First or Second Year Latin. The 96 passages progress in dif.culty, not only reinforcing grammar, but also introducing students to Roman and Greek history, culture, and mythology. What makes this reader unique, though, is that the readings in each section correspond unerringly with a set of grammatical concepts. Thus, each passage will contain only the grammar learned up to that point, so students are not frustrated by an unfamiliar concept that they must .gure out from context. However, this reader is clearly a supplement for review, unsuited to serve as the sole means of instruction for a beginning student. The passages do not provide vocabulary or notes underneath, although the glossary contains every word and the grammatical appendix lists every chart. Moreover, there is no explanation of the grammar, only charts. As a means of reinforcing concepts, though, Latin Readings will do more than just ensure understanding of grammar. Students will .nd themselves immersed in the Greco-Roman world, .guring out the grammar to read of historical battles and people, daily life, and myths. It is ideal as a review of grammar at the beginning of the school year, before getting into the next level of Latin. Latin for the New Millennium: Student Workbook, Level 1 - Teacher's Manual, 1st Ed.